Southern Wind Shipyard announces the launch of Feelin' Good, the first hull of the new SW 82 series. Feelin' Good is a 24.72m composite sailing yacht with naval architecture by Farr Yacht Design and general design, exterior and interior styling by Nauta Yacht Design. Feelin' Good's Raised Saloon version styling provides plenty of light inside - her main saloon is bright thanks to to panoramic windows combined with two large portholes on each side and in the coachroof. She accommodates six guests in three cabins, with the master suite set forward. The 31.6m main mast of Feelin' Good will allow for a sail area of 348m², and in light winds she will be powered by a single 200hp Iveco N40 engine. Feelin' Good will start her sea trails soon. 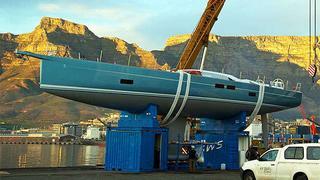 Following her delivery this summer, her maiden voyage will bring her from South Africa to Mediterranean where she will take part to the next Monaco Yacht Show with the SW 102 DS sailing yacht Hevea.